You listen to a band, an artist, musical legends and wonder what it would be like to see them perform in concert? You think here in Ireland that opportunities to see these may not have come along, but they often did. Ireland has always been known as a venue where bands come to test shows before they launch into a wide-scale tour, and with that has come a lot of advantages for Irish audiences. The following will highlight some of those giants who visited these shores, the music and influence they left in their wake, and if like me you are tempted to run to the garden shed to start building a flux capacitor then, it will be a worthwhile discovery. Beatlemania arrived in Dublin very early on in the Fab Four’s career, on the 7th of November 1963 The Beatles played two shows at the Adelphi Cinema which was located on of all places Abbey Street, playing the standard of the day one matinee show plus one evening show. With no rehearsals and no sound-checks the four boys took to the stage performing two solid sets to a sold out capacity for each show of a 2,300 strong and extremely fortunate audience. The screams inside mirroring the riots which took place outside the building, hysteria for the band was at its very peak, even in Ireland. The set was typical of their 1963 Autumn tour and contained ‘I Saw Her Standing There’, ‘Roll Over Beethoven’, ‘She Loves You’, ’And I Love Her’ closing both shows with ‘Twist And Shout’. Within three years the band will have retired from touring and instead set a steady course to change the face and sound of popular music forever. On the 25th of November 1967 The Jimi Hendrix Experience played two shows at the Whitla Hall, Queen’s University Belfast, by all accounts the greatest guitarist ever to set a match to a guitar rocked and electrified both audiences. The set contained the hits; ‘Purple Haze’, ‘Foxy Lady’, ‘The Wind Cries Mary’ and his remake of the standard ‘Wild Thing’, and at one show his reworking of the ‘Sgt. Pepper’ title song as his tribute to The Beatles. What makes this appearance special is the variations between both the matinee and evening shows with songs added and a switch around on the set-list, making it possible to attend two different Hendrix shows on the same day. 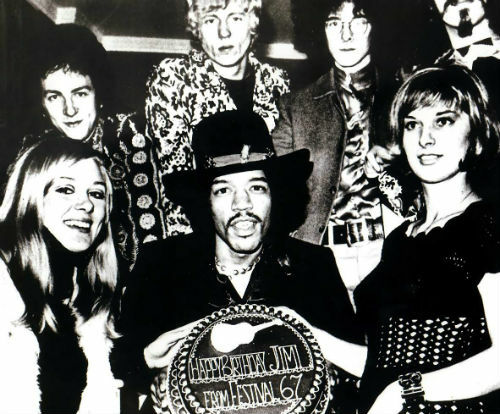 Another point that makes this appearance here in Ireland important is it was the day of Jimi Hendrix’s 25th Birthday, a fact celebrated by the promoters presenting Jimi with a cake before the first show. That is not the end of The Jimi Hendrix Experience and Ireland, Experience bassist Noel Redding left the U.K in 1972 and relocated to Ireland. In the years before his death in 2003, he had made Clonakilty in County Cork his home. In the famous folk venue De Barras in Clonakilty there is a host of memorabilia to the man, his legacy lives on in an Irish town. The Hammer of the Gods, Led Zeppelin hit the shores of Ireland in March 1971, and the two shows they played are of very important significance. This was three weeks after finishing the recording of their untitled 35 million selling fourth album and although, it would be a further eight months before that album would be released the band were hungry to test out the materiel in front of an audience. The first show took place on Friday the 5th of March in Belfast’s Ulster Hall, opening with a thundering version of ‘Immigrant Song’ the audience as expected became charged with the magic pouring from the speaker system. At the time however nobody counted on the inclusion of new material in the form of four new songs, this Belfast show was the very first time the band played; ‘Black Dog, ‘Rock And Roll’, ‘Going To California’ and the earth-shattering ‘Stairway To Heaven’. Nobody had heard ‘Stairway To Heaven’ before, but the sight of Jimmy Page holding that double necked Gibson guitar had already fired the crowd up, the rapture of the applause after the song which can be heard on a very poor bootleg holds testament to how well the song was received. Along with this there was the hugely expanded ‘Dazed And Confused’ and ‘Whole Lotta Love’ both weighing in at over fifteen minutes each closing the show with the second album closer ‘Bring It On Home’. The second night took place in Dublin on Saturday the 6th, contained more or less the same set, Jimmy Page had professionally wrote it down on a piece of toilet paper as legend has it. The Dublin concert, held at the National Stadium on the North Circular Road was packed to the rafters. This was the one and only time Zeppelin would play to an Irish audience, even though, they would dominate the international music scene for a further nine years before the untimely death of drummer John Bonham in September 1980. The legendary Rastafarian musician played one show in Dublin on the sixth of July 1980, a media storm surrounded Bob Marley’s visit over his use and what the some viewed as his promotion of drugs. Nevertheless, it did not stop Marley playing one of the finest concerts these shores had ever seen and in Dalymount Park a nine thousand strong audience bore witness to one of the greatest musicians and activists of the twentieth century. The performance as part of his Uprising tour provided a staggering setlist of sixteen songs, the cream of his music which included;‘Redemption Song’, ‘I Shot The Sheriff’, ‘Jammin’, ‘Three Little Birds’, and ‘War/No More Trouble’. The inclusion of the ‘War’ was very appropriate for the feeling in Ireland in the day, as the spokesman of peace brought his strong message to the Irish mindset of the day. Queen, David Bowie and even the gone-too-soon Jeff Buckley and Kurt Cobain have all visited this land in their heyday. The message is, go see bands when you can. You never know when or if you will ever get the chance again, unless it’s The Rolling Stones who have played here first in 1965, then again in 1982, 2003, 2007 and of course this year 2018.